I reside in Vancouver, BC and over the past week and a half there has been 3 recorded earthquakes along the BC coast. The biggest one was rated at 7.7 in Haida Gwaii. The earthquakes were all fairly far from me and I didn’t feel any of them but we have always been warned about the “Big One” that is suppose to happen sometime in the future. I feel like I should probably be more prepared for earthquakes as I do live right near a fault line. 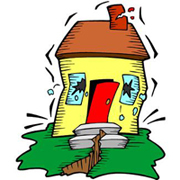 Here is a list of things to have ready so you are prepared for a earthquake.